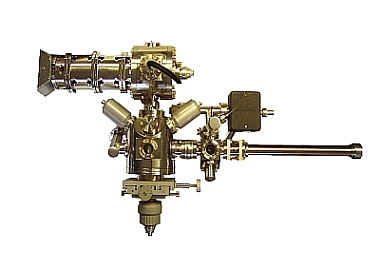 ELMITECs spin polarized electron gun utilizes an activated GaAs cathode illuminated by a circularly polarized infrared laser as a source for the spin polarized electrons. The extracted electron beam passes through a sector field in which electrostatic and magnetic fields are superimposed. For beam focusing, a magnetic double lens array follows the sector field. By adjusting the electrical parameters of the electron optical system, it is possible to turn the beam polarization, which is initially oriented longitudinally, into arbitrary final directions. By the selection of special orientations for the beam polarization in the sample plane (e.g. out-of-plane and two orthogonal in-plane directions), it is possible to analyze the magnetization of suitable samples (SPLEEM). For the activation, the cathode is transferred to a preparation chamber. From here, the cathode can also be removed without breaking the vacuum in the rest of the system. When spin polarization is not necessary for the experiment (e.g. during setup, auxilliary equipment testing or sample preparation), the gun can also be operated in the conventional mode. For this mode, a LaB6 cathode is integrated into the gun. This dual mode option adds the full flexibility of the conventional LEEM to the SPLEEM instrument. Polarization Rotation in Condensors: 180 deg.